Happy New Year! For my first 2016 post we're going to do something a little bit different. This post will not be about fashion or style or image but more about improving your life on a deeper level. Clients reach out to us, not because they want new clothes, but because they want the results - the life that the new clothes represent. A higher salary, an elevated position in their company, more clients, more respect at work when they speak, a girlfriend, a husband, more confidence telling a story at a party, etc...There are all sorts of reasons our clients hire us. Hiring a personal stylist is an example of the kinds of steps people take to achieve the results they want to see in their lives. When we have goals or dreams that we want to materialize in our lives, what many of us fail to realize is that there might be 87 steps that need to happen before that goal comes alive. This is why broad-stroke resolutions are useless. They never encompass every step that needs to take place for the goal to come to fruition. I want to give you the info that helps you turn ideas into reality. Every product and service that exists in the world started in the invisible ether of someone's mind. And it took certain steps (usually many steps) to bring those invisible ideas into real life. Below are some great resources that have those answers. Forget the useless resolutions. Here's to 2016 becoming the year you create something in the world that was only a thought in your head! Whether it's a healthier fit body, finding the right partner in life, building a business, inventing a product, earning more money, etc...There are real steps you can take to significantly change your life for the better. FOCUS. 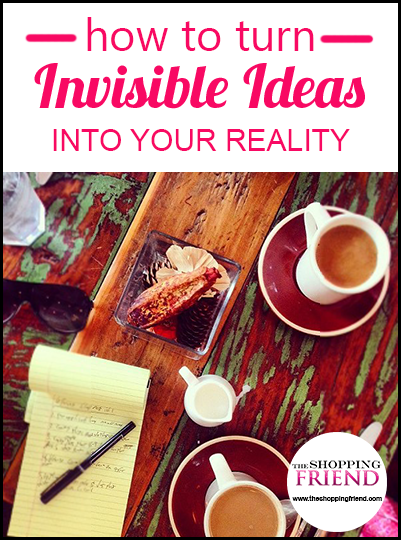 Focus and imagination seem to be some of the most influential factors to turning invisible ideas into material reality. My business and real estate coach used to hammer this into my mind every single meeting we had. He said FOCUS stood for Follow One Course Until Success. I had so many ideas I wanted to pursue and he said I needed to FOCUS on one at a time if I wanted to see success. One of my favorite books of all time is Think and Grow Rich by Napoleon Hill. This book not only redefined my life but has impacted the lives of thousands and thousands of successful and prosperous individuals over the last few decades. Every word in this book is rich with solutions and concrete steps on how to create what you want in your life. You may need to read it a few times to really get it. I have read it five times already. I love it. This post is bigger than your style and image. This is about improving and elevating your life. Let this new year, 2016, be the year you do something incredible for your life. WISHES WILL NOT BRING RICHES. BACKED UP PLANS WILL. Sixth. Read your written statement aloud, twice daily, once just before retiring at night, and once after arising in the morning. AS YOU READ - SEE AND FEEL AND BELIEVE YOURSELF ALREADY IN POSSESSION OF THE MONEY. Andrew Carnegie, who began as an ordinary laborer in the steel mills, but managed, despite his humble beginning, to make these principles yield him a fortune of considerably more than one hundred million dollars. The six steps here recommended were carefully scrutinized by the late Thomas A. Edison, who placed his stamp of approval upon them as being, not only the steps essential for the accumulation of money, but necessary for the attainment of any definite goal. MOST GREAT IDEAS REMAIN DORMANT BECAUSE PEOPLE DON'T HAVE THE COURAGE, RESOURCES, TIME, OR MONEY TO TAKE ACTION. EINSTEIN SAID THAT "IMAGINATION IS MORE IMPORTANT THAN KNOWLEDGE"
Einstein said that "knowledge is limited to all we know and understand, while imagination embraces the entire world, and all there ever will be to know and understand." Nikola Tesla, one of history's most fascinating innovators and a futurist, was a man of legendary imaginative power. Tesla had an eidetic memory that enabled him to precisely recall images, visualize objects and literally work out his inventions in his imagination. Once he was inspired by an idea, he would start building it up in his imagination to the point of first operating an invention in his brain as if it were real, before proceeding to its concrete form. The definiteness of purpose has been described as the greatest principle of all in the formula of success, being the force of psychological charge and the focus of direction of all action for the big achievers and leaders of this life. Taught by Aristotle to Alexander the Great, held in the minds of Andrew Carnegie and Henry Ford, and singled out by Warren Buffett and Bill Gates, focus and determination are the qualities possessed by big winners. When Bill Gates and Warren Buffett first met, Gate's mother – who was on dinner-hosting duties - asked everyone around that table to identify the single most important factor accredited for their success through life. Gates and Buffett gave the same one-word answer: "Focus." Read the rest of this Virgin.com article >> Great ideas: Is imagination more important than knowledge? His idea was sparked after someone left a flyer at his doorstep requesting donations for the blind. I consider myself a bit of a hoarder. I hoard ideas as well, in the form of unchecked points on my to-do list. I keep thinking that I will get to them when I have time, but I never seem to have the right time. So I just keep these points on my list. And I think that a lot of people can relate to this. There’s always that great novel you want to write, or a sweet new board game you want to create. Or perhaps you want to develop a website, or submit an op-ed to the local newspaper. So many things most of us want to do, and yet many of us never get around to checking those things off the to-do list. And you know what? It’s time to face the truth. If we are ever going to get things done, we have to make the conscious effort to accomplish them. Think about it. We have all experienced that one moment where you suddenly think of this great idea, made a mental note to yourself to get back to it later, and then just forgot all about it. Or perhaps you didn’t forget, but continue procrastinate on the project. MOST PEOPLE ARE GUIDED BY THEIR CIRCUMSTANCES. BE ONE OF THE FEW WHO SHAPE THEIR LIVES ACCORDING TO THEIR GOALS. There’s a huge gap between having goals and accomplishing them. The act of writing down your goals plays an important part in closing this gap. According to a study done on Harvard MBA students, within ten year’s time, the students who had written down their goals were making ten times as much as their classmates who hadn’t written down their goals. If you liked this post and got any benefit out of it, please Share it, Like it, and like a teenager's note, Pass it Around! If one of your goals is to upgrade your image and style to attract the relationships, jobs, and earning potential you desire, click below for a free 30 minute phone consultation to learn how we can help you turn that into reality! Our consulting services are offered in Los Angeles, Orange County, Denver, New York, and Singapore. Posted on January 7, 2016 by Michelle McFarlane and tagged think and grow rich napoleon hill achieve results materialize ideas manifest ideas into reality real steps to change your life desire for riches steps to take to succeed andrew carnegie Thomas Edison great ideas convert idea into reality imagination needed for success developing ideas into real life check off to-do list finishing projects control your destiny shape your life write down your goals.